The wheels have been set in motion, and the rivalry between Urijah Faber and Dominic Cruz went up to a whole new level as the world’s top bantamweights coach opposing teams during the 15th installment of The Ultimate Fighter series. Before the two warriors duke it out on July 2012 for the UFC championship belt, their fighters have to compete in a tournament to see who’s the real Ultimate Fighter. Whether you’re a fan of Team Cruz or if you want to see Dominic avenge his only loss by whooping Faber once and for all, you can have an official look the next time you hit the sports bar in this Team Cruz hoodie from UFC. 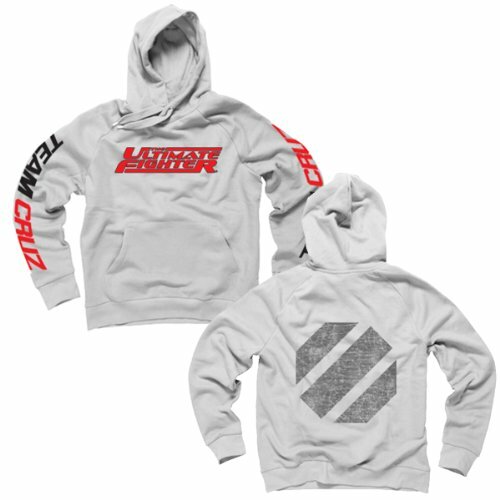 With TUF graphics printed on the front, “Team Cruz” printed down both sleeves and the UFC Octagon logo printed at the back, this comfy hoodie is the very same sweatshirt worn by Dominic and his team!